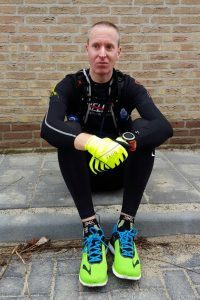 Just as last month; the last weeks have been all about running… There’s some cycling and swimming as well, but those are not the long training-sessions (well, not yet anyway…). So running it is… Short interval sessions, long runs, even longer runs, on the road, on the trail, it just goes on and on and on… The body is feeling good (although I’m writing this post a day after a 74km run, and the body is trying to tell me something about that…), the mind feels strong, so every week I’m feeling like I’m a step closer to the big goal in September! (and the ‘smaller’ goal in April, a little run called ‘The Oner’). 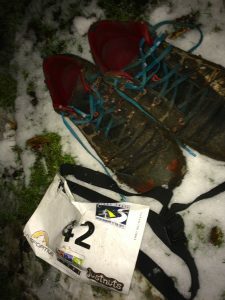 Early February I’m running a ‘night trail marathon’: basically a marathon (although the course was slightly short) through mud and snow… And I started the ‘race’ with the best race-number one could have on a marathon; number 42… The plan is to go easy and take no risks whatsoever; the main goal is not to get injured, so I’m trying to find a group that goes at a pace that feels good, and I hope to stay with them… I’m feeling a bit lazy; I’m running really relaxed, staying in the back of the group, just following the lights of the head torches in the dark forest. It’s really nice to have some people in front of me; when the course gets too slippery there’s always someone in the front of the group who yells, so you know when you need to pay attention! After about 30km the pace drops, and I decide to leave the group behind, since I don’t want to run even more relaxed than I already am… It’s a beautiful course; through quiet, snowy forests, and with a little hill in the end. Unfortunately, I did miss an icy piece of the trail on that hill, so I did manage to crash hard before I got to the finish-line… Luckily there’s no serious injuries, other than a bruised ego (and some pain that was gone a few days later…). At the finish line it’s time for some hot soup, and then there’s another marathon in the pocket! So, mainly a lot of training this month, not too many ‘big’ stories, but we all know that training is all about consistency. So I’m just doing the miles, every week trying to find the balance between training/work/general life stuff (sometimes it’s easy, sometimes it’s not), and enjoying the whole process along the way… I’m looking forward to the next few weeks; again some long runs planned, cycling hours are increasing, and we’re getting closer to The Oner, which will be one of the highlights of the early season!